Step into the living room of our Beachside Retreat. Relax and feast your eyes on the panoramic view of Puget Sound, the Seattle skyline, and the Cascade Mountains. Binoculars are by the window. Look past the porch of our neighboring 1900s home and you might see Mount Rainier in all its glory. You have a good view of the fishing pier, the boat launch, and the picnic tables at the park. In the living room you can either sit or stretch out on the hide-a-bed. Also in the living room are a large and a small over-stuffed chair. You might watch television or read. The coffee table by the couch is one that raises. This table gives you a convenient place for playing board games, card games,or putting a puzzle together. A puzzle, cards and some games are stored under the table More board games are available from the manager. Coasters are there for your beverages.Two of the six kitchen chairs are usually used in the living room. You will find lamps, end tables, a desk and office chair. Look in the desk for a map and a tour book. A few office tools like stapler, staple remover, scissors, and pens are available in the desk. By the entrance you will also see umbrellas in an umbrella stand, a step stool, and a trash container. The garbage can and recycle container are located by the driveway. Early Thursday the garbage truck empties the garbage can. The recycle truck comes every other week. If you would enjoy reading the paper the manager will recycle The Kitsap Sun and the Seattle Times to your porch. The library also has a copy of the papers. Most days the library opens at 1 p.m. There are also some activities in the community room of the library at different times on different days. You'll find a fully equipped kitchen with oven and range and pans for baking, roasting, or broiling. Use the grinder, the coffeemaker or the waffle iron. Blend up a smoothie in the blender. Use the popcorn maker. If you don't feel like cooking, walk over to the Manchester Grill and let someone else cook and clean up for you. Under the sink are the dish soap, rack, scrubbers, sponges, brushes. The pans are in the next cupboard. Broiler pan is below the oven. Many small tools, silverware, and kitchen items are in the drawers. Cutting boards ,knife holder, banana hook, paper towel holder, and toaster are on the counter. Dishes, serving bowls, mugs, pitchers, cream and sugar, napkin holder, spoon holder and more are found in the cupboards. A glass-top picnic table seats four. If you want to use the table umbrella, request it. In the summer some fruit or vegetable may be growing in the garden. Dress up the dining table with placemats and use the vase for flowers. Two extra table leaves are stored in a space near the microwave, so the table can seat up to six with the addition of two more wooden chairs. Ask the manager if a booster seat or children's toys or games would be helpful. Let the manager know if you plan to invite others to the rental. We keep track of both parking and cars using the private lane.. Overnight guests must be approved ahead of time. In the bathroom shower you may notice having the extra space a curved hotel style rod provides. Take a bath if you prefer. Reach under the counter and you'll find the hair dryer.There is cabinet space below the sink. You'll also find extra paper towels and toilet paper stored here.The mini sewing kit is just behind the mirrored mini sliding door. Cleaning supplies, and both beach towels and bath towels, hand towels, and wash clothes are found in the tall bathroom cabinet. A toilet higher than standard height is easier to use, especially for senior citizens. We hope that little conveniences like night lights, room deodorizer, shampoo and soap will make you feel at home. Check the linen closet in the hall for dish towels, dish rags, placemats, light bulbs and a second set of sheets and pillow cases.. It is next to the thermostat. Turn the thermostat to the temperature you like. The furnace is electric. The bedroom wall is completely used up by the double bed and night stands on each side of the bed, A large chest of drawers is opposite the bed and on it is an extra television that is used for watching videos. The closet spans the west side of the room. It has plenty of clothes hangers as well as the broom, dustpan, vacuum cleaner, ironing board, fan and an extra pillow. A foam topper that can be placed on the hide-a-bed is also stored here. Extra blankets revolve from linen closet, bedroom closet, and under-bed storage, depending on the time of year. Beauty inside and out is important. With this in mind, pictures decorate each room and the hall. Two silk flower arrangements are located between the living room and kitchen and dining room. The shrub growing under the large window in the living room is a rhododendron, our state flower. Every day I wake up and check what is happening on the beach. Every night I see the lights of downtown Seattle. I watch the ducks and geese swim, hear the sandpipers calling, the crows and gulls flying and landing in the nearby trees. . I have always enjoyed reading, music, gardening, baking, learning, and teaching. I do volunteer work at a school helping with violin, and at our local library helping with weeding. I play violin in the orchestra for our church's holiday cantatas. I sometimes sing in the choir. My husband and I are retired and celebrated our 50 year anniversary in 2017. 1. The view is panoramic 2. The mobile home is completely furnished 3. Restaurant and post office are nearby 4. Rates are reasonable 5. Located on a private driveway 6. Has free covered parking 7. Is located next to a sandy beach 8. Monthly rentals are encouraged. 9. This is an all-season rental. 10. A writer or artist could use enjoy the rental 11. Grandmas and Grandpas may retreat to "home" while visiting their sons or daughters 12. Traffic is nothing like Seattle traffic - When three cars arrive at the same intersection at Manchester, it is probably rush hour. 8. If you own a boat or kayak, it is easy to get it into the water 9. The mobile home was set in place for a dear relative and her husband. They lived there for quite a while. Another relative also used the home. They took good care of it. I am sentimentally attached to the family home and have fond memories of visiting the people here. The bathroom has an easy to use high toilet. Take your pick of a long soak in the tub and or take a shower. The curved rod is the same type you'll find at some luxurious hotels. The mirror over the sink is large. Storage is available, too. You'll find a sewing kit and a few personal items by the mirror. Under the counter is paper towels, extra toilet paper, and a hairdryer. There is still lots of room for your items, too. The closet holds cleaning supplies and rags, towels, hand towels, wash cloths, beach towels and a beach bag. You are about a two block walk to the library, post office, hair cutting services, the pub and restaurant. On a clear day you will see Mt. Rainier to the south and other Cascade Mountains to the east. You can see Bainbridge Island, the Space Needle, Seattle waterfront, and Blake Island. See ferries, boats, ships, kayaks water birds. Cascade Mountains and Mt. Rainier are to the east and south. Pomeroy Park, a dock, and a boat launch into Puget Sound, are a short walk away. The thermostat for the electric furnace is located in the hall. You share the wi-fi from the owner's house. Manchester library also has internet. 2 or 3 pound weights, elastic bands, and a stationery bike may be checked out. Sunbeam Microwave is behind a cupboard door. Corelle set is microwavable. Please use microwave cover over food. Microwave bowl and egg holder, potholders. We provide paper towels. Proctor Silex two hole toaster. A waffle iron is also available. To expand the table, add 1 or two leaves to the table. Placemats and cloth napkins are in the linen closet. The glass top table under the covered carport has room for four diners. Biography, children's, how-to, travel, romance, Bible, and more as well as magazines can be borrowed. Just ask. A wood game "chest" contains boards for checkers/chess, Parchesi, Chinese checkers, Chutes and Ladders, Cribbage, and one other. There is a deck of cards and dominoes. Croquet, Frisbee, Sand things. Cars, trucks, dolls, tea party, blocks, art materials, toddler toys. Ask. To the north of the home is a large lawn and apple tree, and firepit. Ferns to the west. Stairs, path to beach on east & lawn swing. Vegetable garden & blueberries in season. The courts are several miles away, but we have rackets and balls. Ask. Village Greens Golf Course is about 4 miles away. There are three steps and a railing up to the entry. No ramp. I give this property 4-1/2 stars. I would give it 5 if the pocket doors for the bedroom & bathroom worked better & if the WiFi was a little stronger. If you are looking for a “5 star resort,” this isn’t it. But if you are looking for the almost perfect place to stay in the area, in a great location, with stunning views, at a great price, look no further! Our family lives 3 miles away. Our 2 & 7 year old grandkids stayed with us frequently & we took many walks around the little “town,” in the 2 parks, on the pier & along the beach. We also visited Santa at the Manchester Grill, about a block or so from the home. There was enough room to set up a play yard in the bedroom for the 2 yo. Margaret (Peggy) had Christmas lights around the outside that we turned on each night & a few decorations inside. We had our own tree & decorations, and the place was great for Christmas dinner with the 2 grands & 4 adult kids, along with us. Margaret provided toys for the kids, some old fashioned ones they were quite taken with! She was very helpful with anything we needed. We are from the area but no longer have a house there, so we are very familiar. She obviously can & is willing to provide renters with information about the area. Overall, our stay was very nice & we were happy to have such a perfect spot when we came north for the holidays. There is also a public library, where the kids & I went one day, & the Manchester Tavern, where they have live music some Saturday nights. Looks like another bar has opened a couple of doors down & maybe another small eatery. The post office is also within walking distance, as is a bus stop—although I recommend having a car. Be sure to drive down the hill from Alaska Street when the weather is clear (day & night) to see the full spectacular view of downtown Seattle, the Puget Sound & the nearby islands. Thank you Julie for staying with us and giving a review. That's a lot of good information. I am using this opportunity to answer some questions that have been asked by recent possible renters. The mobile home fits four. Julie reserved for two adults and two children. I appreciate knowing that children will be staying overnight. We have kept toys, games, puzzles to help pass the time - just ask. The Manchester Library has computers and internet. Children's story time has been on Tuesday mornings and includes a craft. The Friends of the Library owns the building and raise funds to maintain it. A book and plant sale continues. The major fundraiser is a salmon bake on Father's Day. During crab and fishing season we watch the action. The high school crew team sometimes practices off the park and dock. On Independence Day there are a lot of fireworks. Early December is the lighting of the Christmas tree, the Christmas Ship stops and carols us for 20 minutes, . The schedule can be checked on Argosy Tours. The Port Orchard Yacht Club also has a small parade past the house. ( We have more than enough decorations to share for most holidays.) This year there were a few polar bear plunges on New Year's day. Veteran's Day there is a ceremony by the library, too. The new eatery is a Taco place. The new micro-brewery is mostly open on weekends. Manchester Grill is packed on Friday nights for their prime rib dinner. The parking lot is filled Sunday mornings, too. Kitsap Transit does have a stop in Manchester, but the schedule is less than desirable. A few residents do commute to West Seattle via Southworth Ferry, but public transportation requires time and planning. There is a pay parking lot at Southworth. Not far from the Fauntleroy dock is a Metro bus stop for downtown Seattle - coming about every 10 minutes. Downtown in Pt. Orchard is a small ferry that connects to Bremerton's ferry to the downtown Seattle waterfront. The pocket doors, the strength of the internet signal, and the size of a double bed, and the distance to where you want to go are factors to consider before making a reservation. I don't consider the open yard any kind of detriment for most people. We have steps that directly access the beach. People who are renting for more than a week may ask about bringing pets with them. It is not appropriate for two large dogs nor more than four people staying overnight. We are about a15 to 20 minute drive from Highway 16. Great host, lovely spot. Very private. Easy two minute walk into the cute town of Manchester. Thank you for taking time to give a review. We love living here, too. Location, location, location and an amiable landlady. 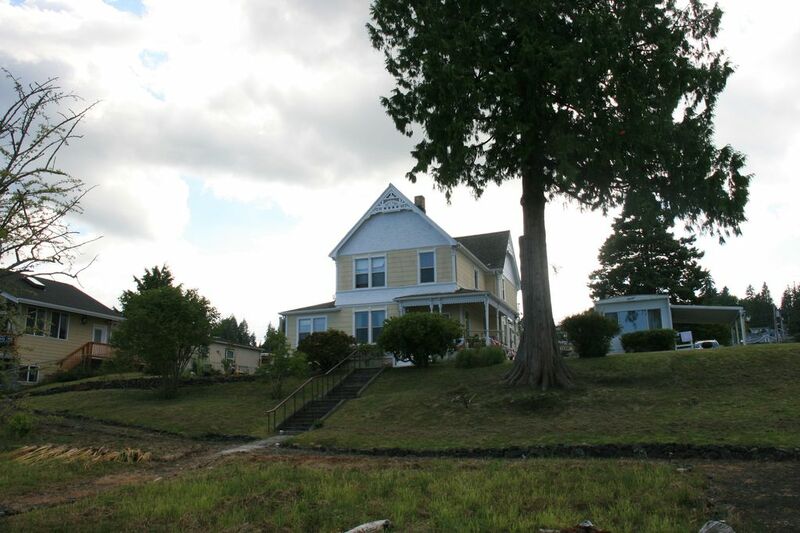 Victorian house with a small trailer on the property directly on Puget Sound. Wish we didn't have so many obligations elsewhere. Small bed in bedroom meant we had to use pullout in living room but that was a small bump. We are glad you enjoyed the view from our single wide mobile home. I hope we see you again. Great location with a great view. I don't like to travel in the Seattle area because it takes all day to get anywhere. The ferries are overloaded and having to wait for the next run takes away hours. Life in Kitsap County is less hectic than in Seattle. Our visitors discovered that summer is a busy time for the ferries. The freeway may be congested, too. Some residents do commute to Seattle. The bus stop at the end of the Fauntleroy dock has a bus to downtown Seattle every seven minutes. (Cash only). We aim to have a clean comfortable vacation home for the lovely people who stay at our place. Words cannot describe this quaint location! I do not believe words nor pictures could show the true beauty that both the rental and the owner has. The tranquility of looking across the Puget Sound at the Seattle skyline at both day and night is fabulous. You can also see Mt Rainier. No one would be disappointed with this vacation rental. I truly enjoyed listening to the history of the area from the owner during our stay. We used both the bedroom and the pull out bed in the family room. Both were very comfortable. The rental is furnished well and is very clean. Thank you Margaret Warren for sharing your time with us. We had good weather that week, so "the mountain was out". Glad to hear that the double bed was "very comfortable". Your positive attitude and enthusiasm are part of the reason we enjoy having a vacation rental. Thank you. This little treasure is located in one of the most scenic locations on the Puget Sound. Unobstructed waterfront views are rare with any hotel or b&b arrangement, not so here. City lights of Seattle at night, and panoramic glory in the daytime, gives this unit a draw that's unique. This single wide vintage mobile home presents a private, homey feel. All of the amenities, full kitchen, cozy and quiet bedroom/bath, and a living room with picture window looking out to the water. Next door was my gracious hostess, who was there and available to assist if anything came up, but not doting. I was up on my own from CA visiting family in the area, and I could not have stayed at a more delightful spot. Clean, well-appointed, warm, and peaceful. Five stars, well-deserved! Thank you for staying, sharing, and appreciating our vacation rental. Thanks for submitting a review. Most of the time our area is quiet and peaceful, with the gentle sound of the waves, but you might hear seals, gulls, crows, geese, sandpipers and other birds. The boat launch area may bring the motors of small boats carrying crabbers or fishermen. On a sunny day are the sounds of families, picnics, dogs at the nearby park. Summer evenings you may hear conversations or live music coming from the pub, or cars or motorcycles coming and going. We love our view and the quiet lifestyle of our village, too. Relax and listen to the waves. Make a sandcastle. Identify shells. Wade in the water. The beach is just a walk down the steps or a stroll down a no-steps path by our home next door. Wi-Fi is available for your computer. Grill. Watch videos. Listen to music. Take photos. Play croquet. Enjoy the view Read. Walk two blocks to the Manchester Library to buy books and to use their computer. The post office, hair salon, restaurant, pub, an investment firm, and a real estate office are within a block of each other. A tour guide and a map is in the desk, for your travel planning. Walk or drive two miles to Manchester State Park. The drive to Pt. Orchard is about 15 minutes. Turn off of Mile Hill by the QFC to follow Village Lane and circle to the right for Village Green Golf Course. A left turn on Long Lake, brings you to Howe Farm, which is popular with dog owners. A fitness center is open all but two days a year. South Sound Regal Theater, and the Hi-Joy Bowling Alley can be seen from Mile Hill. Tuesday is $5 movie day. Swimmers might check out the pool at South Kitsap High School. Access is across from the A&W. The Kitsap County Park with batting cages, skateboarding area, playground, and lots of trails can be accessed by turning left onto Jackson from Mile Hill. Downtown Port Orchard has a playground at the park, , a library, a museum, a venue for plays, restaurants, a passenger ferry and a marina.. Restaurants within a 10 mile radius include Sports bars, Shari's, Chinese, Mexican, Italian,, Thai, seafood, pancakes, pizza, tacos and frozen yogurt. Fast food includes, KFC, Burger King, McDonalds, Wendys, Subway, Dairy Queen. For shopping, go to QFC, Albertsons, McLendon's Ace Hardware, Big Five, Wal-Mart, Fred Meyer, summer Saturday Market, consignment shops, Good Will, St. Vincent, Antique malls, Family Dollar Store, JoAnn's, Lowe's and more. For a ferry ride, you have several choices. Southworth is about six miles and fifteen minutes away. Only a few runs do not stop at Vashon Island. The Fauntleroy dock, is in West Seattle near Lincoln Park. The Bremerton ferry lands at Coleman Dock on the Seattle Waterfront. The ride is about an hour. A small passenger ferry crosses the bay from Port Orchard to Bremerton. Many chiropractors have offices near Pt.Orchard. A dental office is located on Mile Hill near Woods Rd. An urgent care clinic is located not far from the Tremont exit off Highway 16. St. Anthony's Hospital is located in Gig Harbor. Harrison is near Bremerton. Manchester Community Church is the closest church, about a half mile, 4 or 5 minute drive up the hill. has services at 10:25 am and at 6 pm.. Elim Lutheran and Nebraska Street Baptist are about a mile or two away.. Nearer to Port Orchard are Catholic, Methodist, Presbyterian,and Episcopal Churches. High Season: May through August $600 per week. Half week $300 Off Season: $500 per week. Half week $250. We rent monthly or by the week or half week only. Monthly renters may request a pet agreement. Reservations are taken with rental agreement for up to 1 year ahead. The 25% is not refundable if reservation is cancelled. One half of the rental fee is due 60 days before you are scheduled to arrive or immediately if yours is a reservation less than 60 days before. The other half is due two weeks prior to arrival. The property is not fenced. Small indoor pets are allowed only on monthly rentals with prior permission and pet deposit.